The holidays are finally here and we’re sure you’ve already started decorating and getting into the holiday spirit: Decorating your tree, crusting your house in holiday lights, and putting a little bit of Christmas cheer all around your home. Whether you’ve only just begun to decorate or you have the house decorated to the gills with every decoration that you have, the electricians of Front Range Electric want to make you are aware of ways to avoid electrical problems this holiday season. One way to avoid electrical problems this holiday season, and those holidays to follow is to vary up the decorations. We all love lights, but if you’re concerned about giving your electrical company a happy holiday with an expensive electric bill, or want to avoid possible electrical problems, maybe it’s time to try some other decorations. Instead of lights, substitute tinsel, decorated fake evergreen garland, or make your own garland. You could even make it a family affair and hand make your own garland using traditional popcorn, or even stringing small pictures of Christmases past. Before you put up your lights and start adding a little holiday cheer to your tree, or home exterior, be sure to thoroughly check your lights for fraying, exposed wires, or missing lights. All these factors can contribute to possible electrical issues and possible fire. Be sure to check old incandescent lights especially. 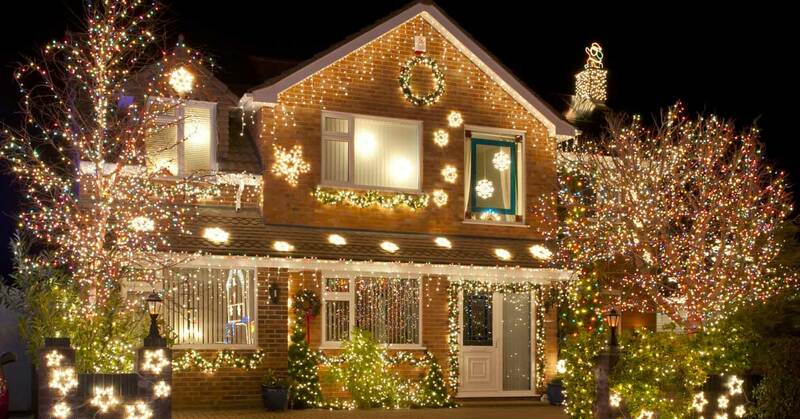 Another way to avoid electrical problems this holiday season is to upgrade your decorations! If you are still using lights with incandescent bulbs, switch to LED bulbs. Lights with LED bulbs not only use less electricity, but tend to last longer than other lights, and are brighter. Don’t worry, you don’t have to throw out all your lights, unless you can afford to do that: Replace some of your strings of lights each year and you’ll see the benefit! If you decide to go all out and adore your entire house with strings and strings of twinkle lights, be sure to plug your lights into multiple circuits. Though you can still plug your lights end to end. Try to orient your lights so you do not plug more than two or three lights into a single outlet. By using more outlets you are putting less stress on one particular outlet and circuit, spreading the load throughout. As you decorate, keep in mind the electrical load of what you are putting on the entire house, as well. Another good rule of thumb to consider when you are decorating is to keep your lights away from heat-generating sources such as fireplaces and mantles, and heating units. These can cause the insulation of your favorite twinkle lights to melt, then causing electrical fires and other potential issues. Though you could argue that something isn’t close enough to do any real harm, it is in our experience that is better to be safer than sorry. Watering your tree plays a big factor in avoiding electrical problems. Dry trees not only look sad and lacking in holiday spirit, but they also pose a big threat your safety: Dry trees plus heat generating, hot incandescent lights can pose large threats to a fire hazard. As mentioned above, be sure to check our lights before you string them for damage, and if you have a real tree, LED twinkle lights could be the answer to avoiding fire hazards. Problems or Questions? Call The Electricians of Front Range Electric! We hope that these tips will help you have a safe and merry holiday no matter if you decorate your entire house or have a small tree in the corner of your condo. Bottomline to avoiding a problem is to replace old lights and avoid situations that will damage them. If you have any questions or concerns about your home’s electrical system, don’t hesitate to call or contact our electricians at Front Range Electric in Colorado Springs! And be sure to tune back, for upcoming blogs on topics such as tips to save money on your electrical bill, how to start a remodel on your home, and more!